The wettest place on Earth is probably the typical American shower. Standard shower heads have a flow rate of 2.5 gallons of water per minute. If the shower is used by two people each day for 10 minutes each, 50 gallons of water fall on the shower floor. In a 3- x 4-foot shower stall, this amounts to nearly 7″ of water pouring on the floor every day. That’s more than 2,400″ per year! If that shower — or any other wet area — is not properly waterproofed before the installation of ceramic or natural stone tile, water intrusion through the subfloor and into the wall cavities can cause severe, even devastating, structural damage. Shortcuts in the surface preparation or tile installation can lead to expensive repairs and long delays in using the tiled area in the future. The project planning needs to start with water management. It is critical to design the walls and floors to direct the flow and overspray of water to run into properly sized and precisely positioned drains. Shower walls should be brought into plumb as needed and shower floors must be properly sloped to direct those gallons of water into the drain as quickly as possible. The American National Standards Institute (ANSI) and Tile Council of North America (TCNA) recommend that a shower or other wet floor slope ¼” per foot (2%) towards all drains. Before the installation of the waterproofing membrane, the floor should be floated with an appropriate cement-based sloping material. Follow the manufacturer’s directions and allow the mortar bed to fully cure before the installation of any waterproofing membrane that will trap moisture. Once the first stage of surface preparation is complete, the assembly can be waterproofed. 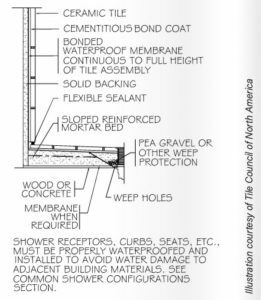 As shown below in Detail B421 in the TCNA Handbook for Ceramic, Glass and Stone Tile Installation, the preferred way to apply a waterproofing membrane is over, not under, the mortar bed. This provides additional protection to the surrounding structure by helping to prevent any moisture penetration through the tile assembly into the porous mortar. Vinyl shower pan liners placed beneath a mortar bed can be improperly installed and may allow leaking into the surrounding substrate. 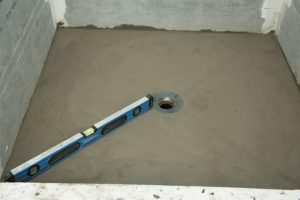 A saturated mortar bed is a recipe for disaster if not properly drained through the weep holes, as illustrated in the accompanying photographs. The best protection is achieved by installing a waterproofing membrane that provides monolithic coverage to walls and floors while tying into drains. There are many materials available today to waterproof the surfaces in preparation ceramic and natural stone tile installation. Generally, these products are divided into two categories: liquid-applied and sheet-applied membranes meeting ANSI A118.10. Installation of a liquid-applied membrane will provide a continuous moisture barrier throughout the project and adhere to drain assemblies. Liquid applied membranes also create a low perm moisture vapor barrier to prevent steam from penetrating the structure. 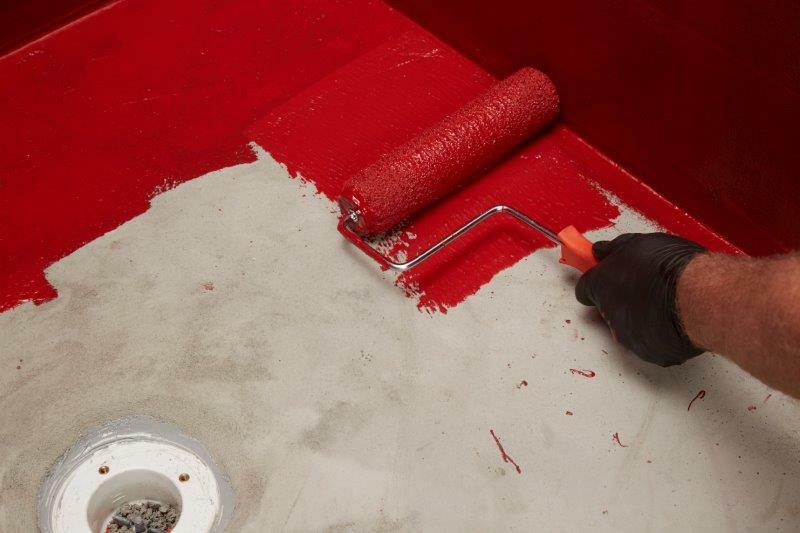 Following the manufacturer’s directions is critically important when installing waterproofing membranes. 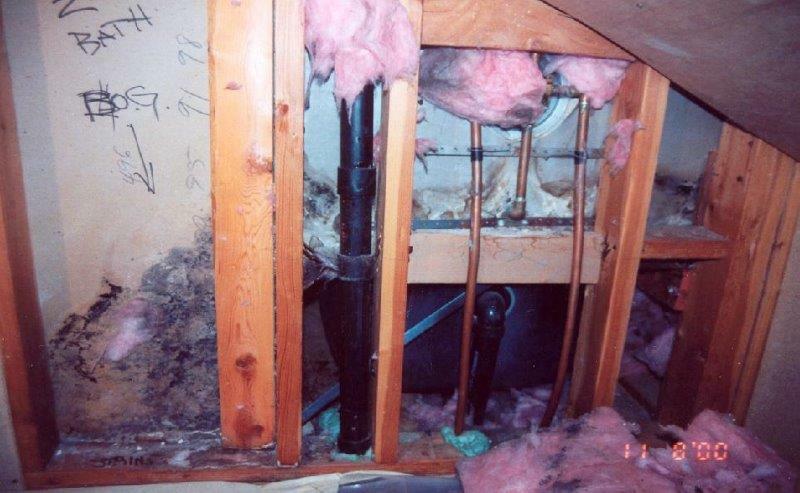 For liquid membranes, the required number of coats, mil thickness and/or coverage rate are key to meeting ANSI and International Association of Plumbing and Mechanical Officials (IAPMO) standards as a shower pan liner. Depending on the project and the type of product used, it will also be necessary to add mesh tape to reinforce liquids at transitions. With sheet-applied products, sheets must typically be overlapped and then treated with seam tape to create a waterproof barrier. 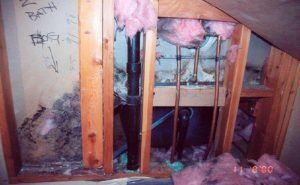 All changes of plane and plumbing protrusions must also be treated to prevent water getting behind the membrane and into the substrate. It is very important that any membrane ties into the drain and does not inhibit the flow of water to the drain. 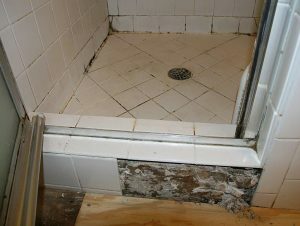 Prepare weep holes to prevent clogging that will allow water to stagnate in the tile assembly. Many believe water cannot penetrate a tiled surface and water is directed over the surface of the tile to the drain. This is incorrect…water can penetrate through the grout and in many cases, the tile itself. The water finds its way into the bonding mortar below, where it remains if it cannot flow to the drain through the weep holes. If the waterproofing membrane has not been properly installed and tied into the drains, this moisture will find its way into the substrate and cause damage below. 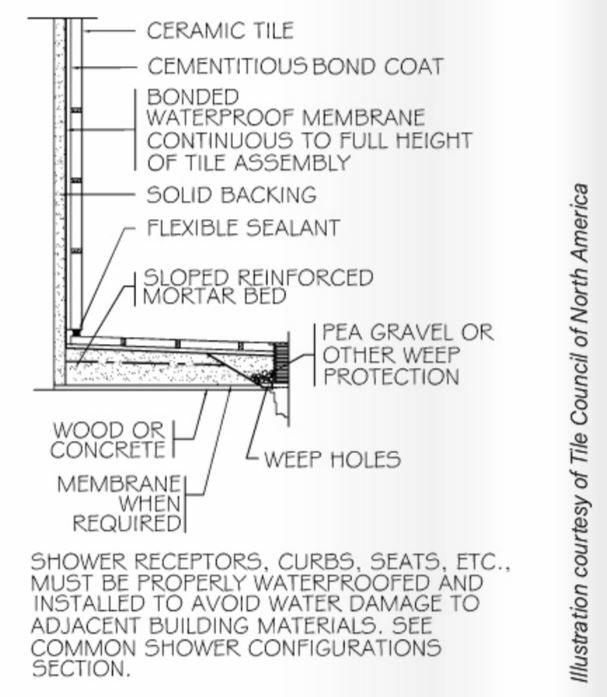 The TCNA Handbook recommends that the membrane is placed up the walls 3″ above the top of any shower curb (6″ if there is no curb) and fully enclosing the curb itself. In most cases, it is best to extend the waterproofing up the walls to the full height of the tile installation. Where a curbless, ADA-compliant shower is being tiled, it is important to extend the waterproofing into the room a minimum of 12″ beyond the high point in the floor. In some cases, it may be necessary to install waterproofing membrane over the entire floor and walls while tying the membrane into secondary drains in the room floor as needed. After the waterproofing membrane is properly installed and fully cured, it should be flood tested to assure complete waterproofing. Once the assembly has been fully waterproofed, tile installation can begin. 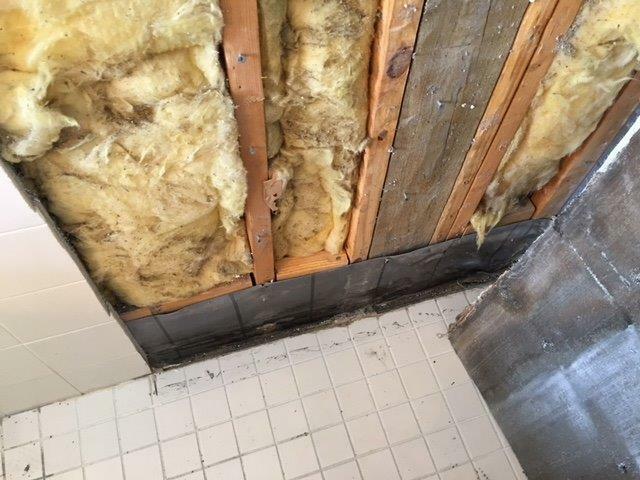 You don’t want to tear out a shower to conduct repairs and cover the costs of restoration because the waterproofing efforts failed. The tile selected should be appropriate for installation in wet areas. All materials must be able to withstand a wet environment and floor tiles must have an acceptable wet Dynamic Coefficient of Friction (DCOF) to help prevent slip and fall accidents. Select a high bond strength mortar that exceeds ANSI A118 and is approved by the manufacturer for use in wet areas. In wet areas, ANSI requires 95% mortar coverage (or contact) to the back of the tile and substrate to ensure adequate bonding. With time sensitive projects a rapid setting mortar may be used — which allows grouting the same day. The final step in installing tile in a wet area is the grouting. Regardless of the grout chosen, keep in mind that both ANSI and TCNA recommend a minimum 1/16” grout joint width. Many tiles with spacing lugs, such as subway tile, are not properly positioned and care must be taken to maintain the 1/16” grout joint width. High performance grouts are more stain resistant, completely waterproof and produce more uniform color grout joints than traditional cement grouts. For maximum stain resistance, you should consider one of the newer 100% epoxy grouts. Installation of these grouts differs significantly from cement grout, and it is important that the manufacturer’s directions are precisely observed during the application to properly fill joints and remove excess grout from the surface of the tile. With many textured, porous or natural stone tiles, the grout is much easier to spread and clean if the tiles have been pre-treated with a grout release. It is advisable to prepare a mock up to confirm the color of the grout as well as evaluate the difficulty of grouting and potential need for a grout release. Finally, if a cement-based grout is selected, it may be necessary to seal the tile and grout prior to use with a penetrating sealer. This will protect the grout from common household stains and allow for easy maintenance. Periodically, the tile and grout should be tested to see if water drops penetrate the surface, which is an indication that the assembly needs to be re-sealed to maintain protection. Thoughtfully managing the movement of water in wet areas by following manufacturer’s directions and constructing to building industry standards will result in a tiled assembly that will last a lifetime. Previous : Do You Know Everything About Backer Boards?